This Mexican hacienda manuscript consists of one leather bound volume containing the inventories, division and distribution of major landholdings and other property among surviving heirs of Juan Quintero [Romero] according to his testament. The manuscript, prepared in 1823 and first signed at Hacienda Buenavista del Coxo in September, 1824 by his brother and testamentary executor Cayetano Quintero [Romero], describes the property as it was in 1821 at the death of Juan Quintero, with additions to the manuscript up to 1831. The two male figures in the first illustration are presumed to be Juan and Cayetano Quintero, principal co-owners of the haciendas and other properties described in the manuscript. Illustrations, maps, and possibly much of the text, measurements and financial accounts, of the haciendas, were created by J.A.Q, or José Antonio Quintero, brother of Juan and Cayetano. The largest and most opulent of the properties described in the manuscript is the Hacienda Buenavista del Coxo [cited on recent maps as the ex-Hacienda del Cojo], with a detailed inventory of its houses, equipment, crops, servants, cattle and other livestock, coaches, silver objects, furniture and a chapel with sacred objects and images. 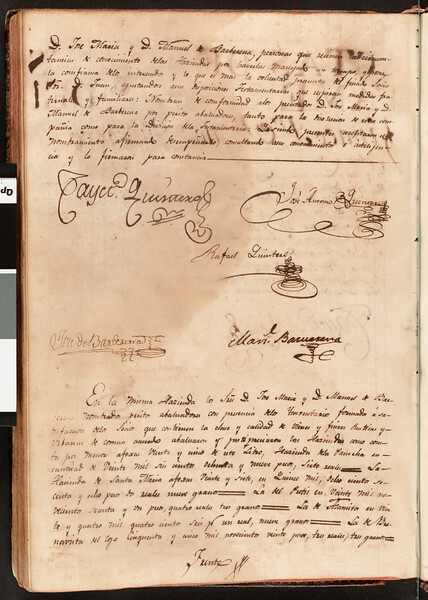 The document also contains detailed measurements of all property boundaries and areas, estate inventories and valuations, active and passive debts, funeral expenses, division and distribution of land holdings and allocations of the properties among Juan's brothers, his wife María Gertrudis Barverena (sic. ), their eldest son Rafael Quintero y Barverena (sic.) and his two other sons, two daughters and two grandchildren. Numerous other individuals are mentioned in the document, with signatures of their accountant and witnesses from the Barberena family.